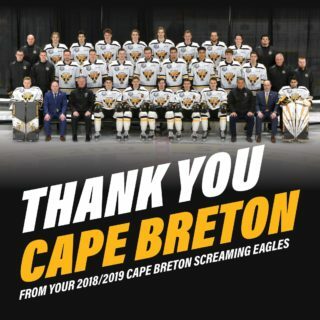 The Cape Breton Screaming Eagles will look to extend a four game home winning streak tonight as the host the Acadie-Bathurst Titan at Centre 200. 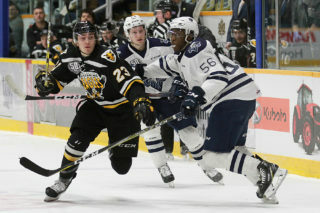 Both teams were in action in Nova Scotia last night, as the Titan fell 5-3 in Halifax while the Eagles rallied to top the Moncton Wildcats 3-2 in a shootout. Tonight’s game is the last of a weekend home stand for Cape Breton before they head out to Charlottetown for a pair of games next weekend. 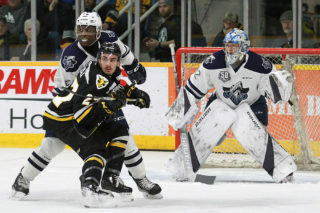 Last night the Eagles trailed 2-0 heading into the third period, but goals from Brooklyn Kalmikov and Mathias Laferrière (with seven seconds left) forced overtime before the home team prevailed in a shootout. 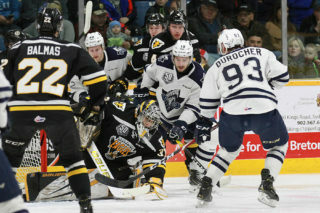 The Eagles have won more games (seven) than any other QMJHL team when trailing after two periods, and only Drummondville has a better winning percentage in the QMJHL in games in which they trail after 40 minutes. Heading into tonight’s game the Screaming Eagles are tied for fourth (with Rimouski) in the ultra competitive Eastern Conference, one point behind Moncton and one point up on Charlottetown. This season the Eagles have a record of 27-15-3 (14-7-1 at home), while Bathurst has a record of 7-35-2 (4-15-1 on the road.) Bathurst is last in the league, ten points out of the final playoff spot. This season the Eagles have won four of five meetings this season, including two of three at Centre 200. One familiar face on the Titan is Ian Smallwood, who was traded from the Screaming Eagles on the final day of the trading period. Thus far in Bathurst he has recorded one assist in five games. Smallwood was part of a massive reconstruction in Bathurst that saw the Titan move out key veterans Noah Dobson, Michal Ivan, Ethan Crossman, and Keenan MacIssac. Among the players added were important blueliner Oliver Turan and two players chosen in the second round of the QMJHL draft in Nicolas Kingsbury-Fournier (2018, Moncton) and Mathieu Desgagnés (2016, Chicoutimi).